There was pandemonium at Ori Oke community in Makoko, Lagos State, on Thursday as armed policemen and officials of the Lagos State Special Task Force on Land Grabbers clashed with some youths in the neighbourhood during which two residents were reportedly killed. The deceased – Kola Iwalokun and Emola Julius – were allegedly shot dead by the police, while many others reportedly sustained gunshot injuries in the incident. A church, The Acts of Apostle Church, which houses several buildings and about 15 makeshift shops, was said to have been set ablaze by the enforcement agents. 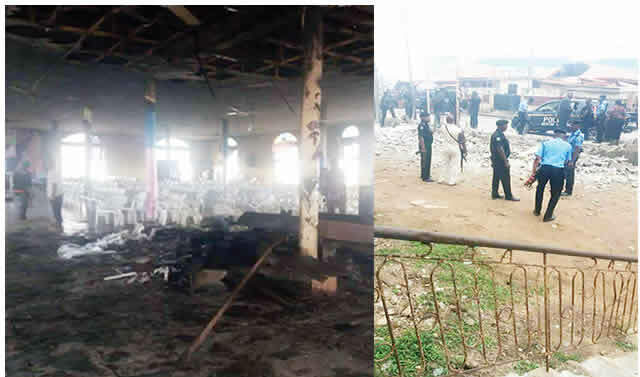 In a reprisal, angry youths reportedly invaded a police post in the Adekunle area, a neighbouring community, and destroyed some valuables, including some vehicles parked in the station. Punch learnt that while some of the police operatives were in uniform, others wore jackets with the inscription, ‘Raider,’ which were usually used by men from the State Criminal Investigation and Intelligence Department, Yaba. It was gathered that the task force officials, accompanied by the policemen, had raided the community around 10am to evict the residents, whose buildings were constructed on a disputed parcel of land. The policemen allegedly shot indiscriminately to scare away the residents. A resident, Ayodele Akintimeyin, said the case on the land was before the court, noting that the invasion caught them unawares as they had not been issued any previous notice to quit. He said, “People have been living on the land for about 70 years now. Some land grabbers came a few years ago and said it belonged to them. The matter was taken to court, but they decided to take the law into their own hands. They involved policemen and the community was invaded this morning (Thursday). They did not show us any letter. “Two persons, Kola (Iwalokun) and Emola (Julius), were shot dead and no fewer than seven others were injured. Two people are in critical conditions at the Mainland General Hospital. Others were shot in the legs and they have been taken to hospitals for treatment. The policemen shot directly at people. They burnt the church and 15 shops outside the church. Chairs and musical instruments in the church were also burnt. Another resident, Damilola Ogunbekun, who spoke to our correspondent on the telephone, said the policemen were still on the ground as of 6pm when she fled the community. She said her elder brother, Junior, was shot in the leg, adding that she could hardly pick any of her valuables. A source, who lives in the Adekunle area, said the Thursday incident was the third time the police would invade the community. A police source at the SCIID, however, said the residents attacked first. He said, “Men of the Lagos State Task Force on Land Grabbers went to the community to demolish some buildings. While they were working, some hoodlums attacked and chased them into the Makoko Police Post. The hoodlums had weapons and they burnt vehicles at the police post. The Chairman, Lagos State Special Task Force on Land Grabbers, Akinjide Bakare, was evasive when our correspondent contacted him on the telephone for enquiries. However, the Lagos State Police Public Relations Officer, SP Chike Oti, said one person was killed in the clash, adding that the state Commissioner of Police, Edgal Imohimi, had ordered an investigation into the incident. He said, “The task force on land grabbers went to work in the community because they had a valid court order to execute in that location. Unfortunately, they were attacked by youths of that area, who mobilised in large number to fight the law enforcement officers. A call came to the police to rescue those task force men, but by the time the police got there, there was information that somebody was shot and rushed to a hospital, where he died. “The police intervened because they were called upon by the task force that the youths were firing at them. The prompt intervention of the police brought the situation under control.